The following are thoughts from Jenni, a Psychologist who attended the Talking Mats Accredited training course. ‘Meeting with five colleagues from Sweden, England and various parts of Scotland for the accredited Talking Mats Training this month has been a fascinating experience. 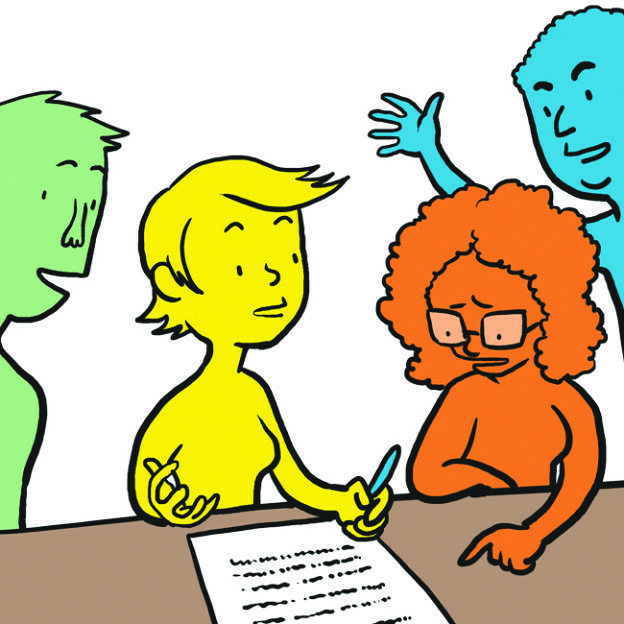 I have been accustomed to using Talking Mats with children and young people over the past seven years, and have seen the value of the approach in helping young people give their views for a meeting – particularly if they have communication difficulties and would struggle either through lack of confidence or skill to speak out when others are present. However, we were not just a group who work with children and young people. Most came from health settings and examples were drawn from elderly patients, some with dementia, others with autism. As we shared our videos and told our stories it was obvious to me how relevant Talking Mats can be in those settings too. Some of the stories shook me. One person told how she was deep in conversation with a lady over her Talking Mat when the tea lady burst in, poured a cup of tea for the resident, asked if she was having a good time playing at puzzles, then left before any answer could be given. Time and again we found ourselves asking what is it about our institutions that puts routines above real communication and above proper respect for an individual. In preparing a video to bring to the training I undertook a Talking Mat with my father, who is almost 90. It was a new kind of conversation for us both, but we were surprised – the structure allowed us to talk about what was going well and what needed a bit of an adjustment in domestic life and we both learned from the conversation. I think we will do it again! Indeed, at one stage in the training we were asked to dream big and look at how we might want to take use of Talking Mats into new areas. I identified some good friends – one 91, one 101 and one 104 – where conversation can become rather one-sided. I am interested in the power of Talking Mats to help create a genuine dialogue when these friends are reminiscing, in other words, to help me to be not just a listener but to enter the dialogue. Having a record of the conversation will help us take the discussion further when we return to it. This entry was posted in Blog, Children and young people, Communication difficulties, Dementia, Personalisation, Talking Mats principles, Training and tagged AAC, Accredited training, Communication difficulties, Dementia, Participation, Talking Mats, Training, Young people on November 20, 2013 by Guest Blogger. Thank you Joan and Sally for the fantastic hospitality and inspiring 2 day accredited train the trainer course at Stirling university. 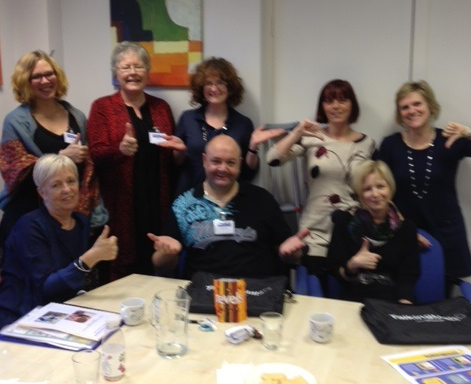 I cant wait to carry out our first session with all of the fabulous advice and support materials you have given us. Talking mats can reopen doors to communication that others may fear were closed for ever. I was so lucky to meet a group of lovely people on the course, who also share the same enthusiasm for using Talking Mats. It is absolutely fantastic to be part of something that is world wide and getting bigger, long may you reign and long live Talking Mats. This entry was posted in AAC, Blog, Communication difficulties, Training and tagged AAC, Accredited training, Communication difficulties, Participation, Talking Mats, Training on November 19, 2013 by Sally Boa. In the end of October, I pushed my bad flying-nerves aside and travelled from Stockholm to Stirling to attend the Accredited Training Course at Talking Mats. It was two intensive days where we, a small group of six people, in a structured way learned about and had the chance to try out different aspects of teaching Talking Mats. It was interesting to hear the other participants’ experiences with Talking Mats. Both Joan and Sally who held the course were encouraging and enthusiastic. Doing all this in English made me a little bit dizzy at the end of the days, but nonetheless I came home with a lot of new perspectives and ideas I will try on my colleagues in my first own training session next year. Please have a look at my Evaluation Mat! This entry was posted in Blog on November 16, 2013 by Guest Blogger. During the final stages of developing Digital Talking Mats, we invited some people with aphasia and their partners to come and try it out for us. I spent some time talking to Matthew, who has severe global aphasia and dyspraxia. Matthew loves having a chat, but relaxed conversation can be a challenge because Matthew finds it difficult to generate language and sometimes his yes/no responses get mixed up. I used the ‘activities’ topic with Matthew to have a chat about the things he likes (and doesn’t like) doing. 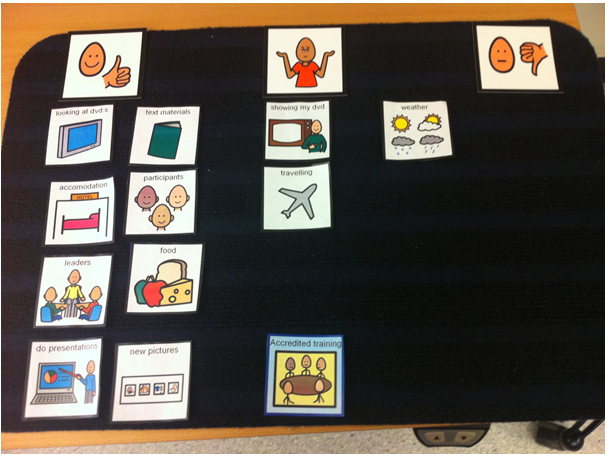 Matthew found the Digital Talking Mats easy to use and quickly gave me his views about activities. Using the i-pad made the conversation feel very natural, and Matthew was able to convey his sense of humour – when I asked him about Church; Matthew started to sing the Funeral March! We had quite a laugh about this, and it turned out that at the moment, Matthew really only goes to Church when there is a funeral. Matthew was also able to tell me about things that he finds difficult since his stroke, such as reading and doing DIY. During our conversation, I was struck by how equal the conversation felt. Matthew was able to express his views without feeling pressurised to think of words. I was able to ask Matthew open questions without worrying that I might not understand his responses. Using Talking Mats on the i-pad was easy and relaxed. I could imagine using it with Matthew to have a chat over coffee or at the pub. Perhaps we should think of some conversational symbol sets? This entry was posted in AAC, Aphasia, App, Blog, Communication difficulties, Participation, Personalisation and tagged AAC, App, Communication difficulties, Participation, Talking Mats on November 15, 2013 by Sally Boa.